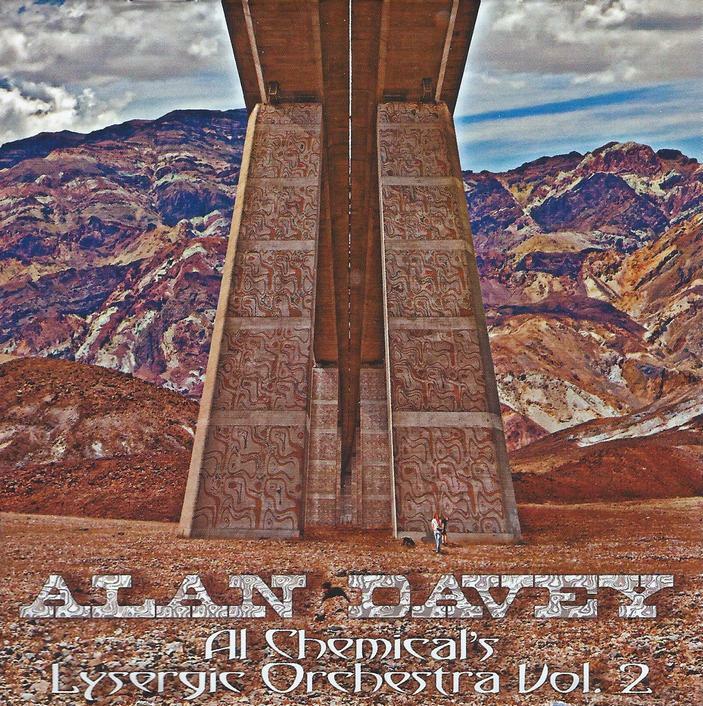 Alan Davey’s first Al Chemical’s Lysergic Orchestra album came out in 2001 (later reissued as Vol. 1, with 5 additional tracks), and now we’ve got the just released Vol. 2. In 2011 while touring the US with Gunslinger, Alan and Kevin Sommers, who has done album art that I’m sure many of you have seen, visited Death Valley. The experience left such an impression on him that it inspired the music on this album. As Alan says, “Never has a place affected me like Death Valley. The silence there opens the mind to another level and musical ideas flood in.” Each of the ten tracks is named for a Death Valley location, and the 12 page booklet that accompanies the CD features photos of each of these locations. Musically, Alan considers the Al Chemical albums an opportunity to indulge his more “experimental” interests. The opening song, Goodbye Death Valley, is a trademark Alan Davey “bass assassin” rocker. If you played this for me blind I would have identified it as Alan in the first 30 seconds. But it’s not really what this album is about. Bad Water rocks too, but has a dreamier spaced out quality, plus vocals by Kevin. The rest of the album demonstrates Alan’s flair for thematic development, and music that would be ideal for film or television soundtracks, though it’s by no means short on Rock. Hell’s Gate is a moody, tense, atmospheric piece with orchestral elements. It has a powerful narrative drive and covers a lot of ground in barely 3 minutes. Dante’s View starts off similar, as a weirdly image inducing glom of soundscapes and effects, before launching into a melodic, easy paced rocker, and even has a bit of a Middle Eastern theme. The Racetrack covers a lot of ground too, with equal parts space-orchestral, electro-dance, Middle Eastern, and cool jazz elements. Mustard Canyon has a potently rhythmic electro throb, deep space symphonics, alien effects and dreamy melodies, and then in the last minute shifts to full blown dance mode. 49’ers is similar and includes spoken word by the late great Robert Calvert. Titus Canyon is a cool grooving, melodic spaced out piece that would be the perfect soundtrack theme music to Al Chemical: The Movie! Old Dinah is quite different, being a quirky, whimsical piece that’s part stage show, part Kurt Weill, and part alien effects. It’s tough to describe but very cool. Kevin is credited with “drunken hobo crooning” and that couldn’t be a more apt description. And Zabriskie Point is a deeply atmospheric piece that closes the set on a somber, yet meditative note. Alan has built up quite a resume, having been in Hawkwind, Bedouin, Gunslinger, Pre-Med, The Meads of Asphodel, others I’m probably forgetting, plus numerous solo albums, and Al Chemical adds impressive and enjoyable variety to an already stellar body of work. NOTE: Alan has a U.S. distributor now. When ordering from his web site you will pay normal for UK shipping charges. No extra for overseas.